A couple of years ago, Revlon released a line of scented nail enamels packaged in cute, vintage-inspired bottles. I never saw them around my area, but when I made a rare trip to Wal-Mart in June, I spotted two Parfumeries on a random shelf, looking quite lost. There was no price tag anywhere to be seen, so I just picked up one color to give the product a try. The shade I chose, Beachy (110), is actually somewhat similar to the new fall Essie I just reviewed on Saturday. Compared with Essie Leggy Legend, Beachy is lighter and less blingy. It’s not a bad color at all (in fact, I liked it reasonably well when I swatched it last month), but compared with the Essie, it’s a little blah. I also paid around the same price for the Essie (CA$6.99 for the Parfumerie, CA$6.95 for the Essie), so given the choice I’d have just stuck with Essie. Application was fine, and two coats was opaque. I have no real complaints about the formula, though Beachy’s metallic finish does hide any streaks quite well. Each of the Parfumerie shades has a different scent, and I didn’t find Beachy to smell especially…beachy. It just smells like cheap suntan lotion, with a heavy dose of nail polish remover (though this note fades once the polish is dry!). I guess it was too much to hope that a nail polish could smell like Dune. But to tell you the truth, I learned that fragrance is not something I like in my nail polish. I don’t even think I’d like it if the scent was one I really loved. I found it to be terribly distracting, as every time my hand came close to my face, I’d get a whiff of fragrance. That’s not how I like to smell my perfume! It’s a nay for me. I do wish that Revlon would package all of their regular nail polishes in this bottle, though. It’s super cute, and a bit smaller than the classic Revlon bottles. 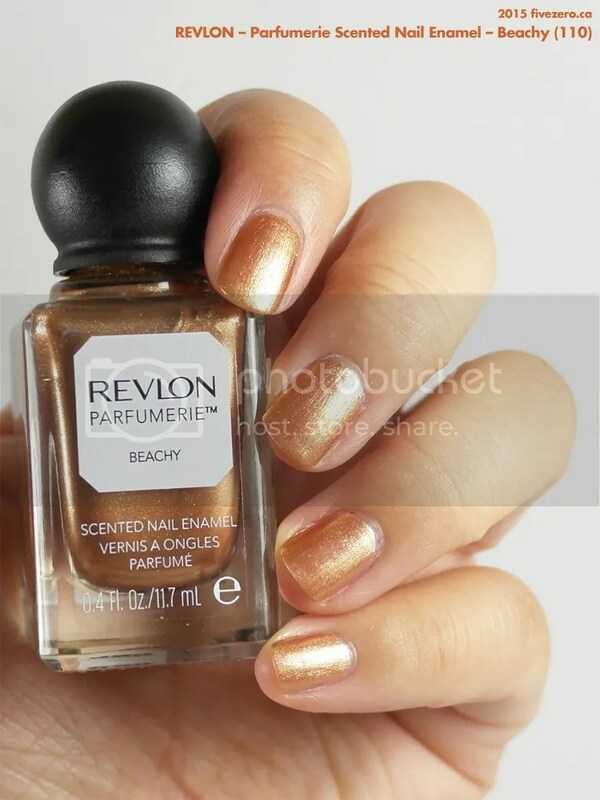 Revlon Parfumerie Scented Nail Enamel retails for around US$4–5 (I paid CA$6.99) and is 0.4 US fl oz / 11.7 mL. They are free of toluene, formaldehyde, and dibutyl phthalate (DBP), and are made in the USA. Revlon was founded in 1932 by the Revson brothers and Charles Lachman—hence, RevLon! It is a public company based in New York, NY, USA. Yes, that was exactly me! Hahaha! My first encounter with scented nail polishes were from Claires – a GRAPE scent – yum! I also like the rose scented ones of Anna Sui. But I completely agree, these bottles are way better – only thing I don’t LOVE is the round knobby handle. Ah yes, I think I have one of the scented ones in the regular bottle. (https://fivezero.wordpress.com/2015/05/07/revlon-scented-nail-enamel-grape-icy/) The formula was bad, though, so I didn’t even keep it on long enough to consider the scent (which was a bit foul). $2 for the Parfumeries is a steal! I agree, the little round cap could be changed to something more functional. It’s hard plastic so it’s can be a little slippery. Ha, I should have known that the Anna Sui polishes would be rose-scented! 😀 I imagine the designer herself swans around in purple clouds of that scent. Oh yeah that Grape Icy looks bad. I liked the creme finishes. I admit, all the rose scents can be a bit overwhelming, but I guess it’s her signature, and she’s going to milk it for all its worth! hmmmm, nail polish with fragrance? I can’t imagine liking this. I feel like it would clash with whatever perfume I am wearing. I had no idea there was even such a thing. I have beachy and I haven’t tried it yet! I was just thinking the same thing that it looks similar to leggy legend!!! I recently tried the Revlon scented nail polish in Spun Sugar and I had to take it off within an hour of applying- the scent was so heavy headache inducing! I don’t mind the lighter scents, but some of them are a nay for me, as well!!! If you come across them, and they’re not too expensive, it’s worth getting one just to check it out 🙂 You may like the scent! Some of the colors I’ve seen online are cool, too.